Join or renew with us on-line! If you wish to renew, you must first log in at the top right corner of the page. Once you are logged in, a menu item will appear in the left menu, allowing you to renew your membership. If you are using MasterCard, VISA or American Express, you can complete your renewal or membership electronically. We use Secure Sockets Layer (SSL) technology, the standard in Internet encryption, to protect the security of your credit card information as it is transmitted to us (provided by VeriSign, the leading provider of digital trust services). If you are using a browser that does not support forms, or if would prefer to use regular mail, we have provided a printable form for your use. You may also join by phone, (215) 238-6313, using your MasterCard, Visa or American Express. Office hours are Monday through Friday, from 8:30 to 4:30 p.m. 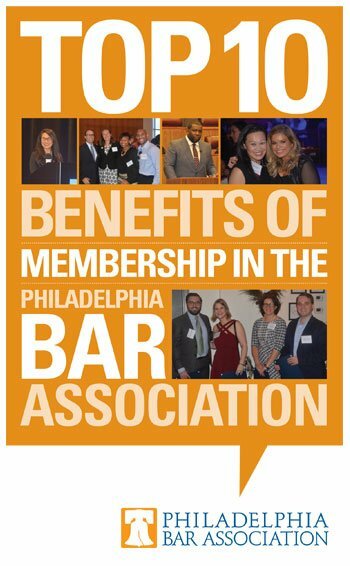 Membership fees for the Philadelphia Bar Association remain among the lowest fees charged by major urban bar associations throughout the United States. Attorneys admitted to practice before any court of record in the current year are entitled to a free, one-year membership. Section dues still apply. Attorneys who have previously been admitted to practice in another state do not qualify. Those admitted to the Bar one year or more but less than two years, $99.00; two years or more but less than four years, $199.00; four years or more but less than ten years, $299.00; ten years or more, $399.00. Full-Time members of Law School Faculties may join as voting members. Maintaining a principal office for the practice of law in Bucks, Chester, Delaware or Montgomery Counties, Pennsylvania, or Camden County, New Jersey, $175.00; Full-Time Members of Law School Faculties, $175.00; Law Firm Administrators, $130.00; Law Librarians, $130.00; Other Associate Members, $150.00; Paralegals, $65.00; Law Students, $20.00. Please note: Pursuant to section 100(A)(2) of the Association's bylaws, nonvoting members enjoy all privileges of Association membership EXCEPT the rights to vote and hold office. A regular member for at least 25 years who has reached the age of 70 years, or is 65 and retired from active practice. A written request must be made to become a Senior Member, $60.00. Note: Your date of admission to the Bar shall be calculated from the date you were first admitted to practice before any court of record. Your first years fee shall be one-half the annual membership fee if you join on or after July 1, but before October 1. If you join after October 1, you pay no fee for the remainder of the calendar year, and your full fee amount is applied to the following year beginning January 1. $2.50 of your membership dues goes to the publication of the Philadelphia Bar Reporter newspaper, and $2.50 of your membership dues goes to the publication of the Philadelphia Lawyer magazine.